We’re walking downhill in the park, N in pink and green hijab and me sporting my red keffyiah keeping the wind off my neck. They’re walking up. The kids are way out in front, bobbing yarmulkes, followed by mom in her wig and the reddish bearded, black hatted dad. As we pass the kids with a “Happy Hanukkah” we get vaguely frightened looks in return. We try again with the parents but only stony stares come back at us. “Maybe they thought we were going to attack them?” This is said with a laugh, of course. Ok, being asked “What is it like being a Muslim in America today?” is bewildering to me. Why would a person not think of this question as it applies to them? What is it like being a Christian in America today? What is it like being Jewish in America today? A Buddhist? A Sikh? Basically what I am trying to say is WHAT DIFFERENCE DOES IT MAKE? Why should this question have to be one at all? No matter what faith we follow, what race we are, what countries our families came from, at this point we are all humans living in America. There are good humans and bad humans in all these groups, and many others, all around the world. With recent terrorist acts committed by people who happened to be of the Muslim faith, life has become very difficult for many Muslims, especially the most visible of us…women wearing hijab. Look, by no means am I saying that any of these acts are not terrorist acts. I am actually saying that they are, but at the same time so are attacks on Planned Parenthood, the Oklahoma City Bombing, and even crimes by drug dealers in neighborhoods by non Muslims. Why are these not called acts of terrorism? Last I checked terrorism meant instilling fear into people by an unconscionable act that is inhuman. When these events occurred/still occur, Muslims don’t go around saying we need to send all Christians/Jews home. 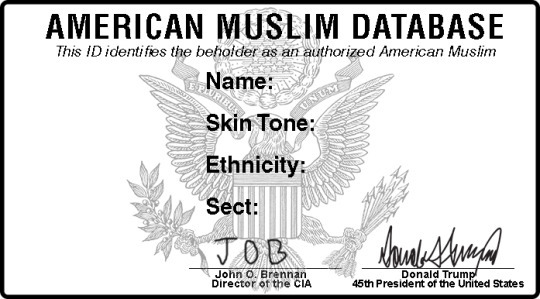 We don’t say let’s make all Latinos/African Americans get registered to a list so we can monitor them to see if there is a chance they will commit terrorist acts against fellow citizens. The more someone like Donald Trump opens his mouth and spews hate, the more the media wants to cover it, and the more people end up seeing and hearing it. This plays on people’s fears and their treatment of Muslims becomes astonishingly hateful, even if they have never been personally negatively affected by any action from a Muslim. So my sister was asked the question about what it is like being a Muslim woman in America raising girls. She brought the question up to me, and my immediate response was “What would my sister know about answering this question?” I say this because my sister does not wear hijab, so she is not someone who would be recognized as a Muslim by anyone on the street unless they personally know who she is. It is a completely different world for me as a Muslim woman who wears hijab. I am one of those who will be immediately recognized and get the brunt of the anger, hateful words, and/or physical harm. It is also a completely different experience my husband who cannot be visibly recognized as a Muslim. This is a very subjective question, and will be answered very differently by a man vs a woman, a woman wearing hijab vs not wearing a hijab, naturally born American Muslim vs a Muslim who immigrated to America. I am a Muslim first, then I am an American, then a mother. I was born and raised in Brooklyn, New York. I moved to Florida when I got married and felt like I moved to another country when I did. It has been full of nasty glares and unwelcoming feelings ever since I moved here, but I accepted the fact that these people don’t know me, and they are not used to seeing people like me since this is not a melting pot state. Don’t get me wrong, I met some very nice people who are not afraid to ask questions and learn about who I am as a person. I am not the type to be offended by anyone asking me a question about my faith; I actually welcome it because I do not believe ignorance is bliss. These are the people who looked beyond how I dress and what my faith is; they now are considered friends because I know they understand me and have my back if I need them. These are the people who now call to check and see if I need anything because I don’t leave my house often anymore. I have 2 girls and do not go out much with them because of my fear that they will hear something awful being said to me. I make my trips to the mall with them quick, if I can help it, I have my husband take them out for other things. In the last few months, I have had people spit at me, try to deny me service, tell me to go home, and utter hateful words that make me look for the nearest exit and law enforcement simultaneously. This is all stuff I can handle and deal with on my own when my children are not with me; the problem is if something happens when my kids are with me because the problem becomes twofold. My first reaction is “How do I protect my kids from this?” My next reaction is “How do I deal with this to make sure it isn’t just something I am going to let slide?” To the person who spit in front me, I immediately responded with “That is so rude and disgusting”, and just kept walking. To my daughter who asked why that person spit at me, I respond “They were not spitting at me; they are just a disgusting person who couldn’t find a tissue or trash to spit in to clear their throat.” Thankfully, this has been the only incident when my children were with me. Last month I went to Target, early morning because it isn’t busy, to pick up a box of cereal and some coffee. Only two registers were open at opposite ends of the store, so I got in line at one register. An employee walks behind the register next to the one I was at, but doesn’t turn on the light to show the line was open. He serves a man in a red shirt who seemed to be a fellow employee, so I kindly “tried” to ask if he was opening the lane, and the employee abruptly responded “No, no. I am closed.” I kept quiet and moved back into my original line. Then a woman comes to stand in line behind me, she sees this employee at the register next to us and walks over there with her gum and chocolate bar. Then another woman immediately got into that line and was going to be checked out. When I saw that he started to check the second woman out, I moved over into that lane and the employee looks at me with his hand up ready to tell me he is closed. This time, I had to abruptly stop him from saying anything and made it clear to him, “You just told me you were closed, yet you served two people.” I made sure I was loud enough for people and the cashier in my original lane to hear me, and it was at that moment that he moved the conveyor belt to check me out. I made sure that I stated it was not professional to deny a customer service one second, and to turn around and give service to two others seconds later. I took my bags and left the store. I go to Walmart to pick up a few things for the house, and hear “Get rid of them!” I turn around and to my face I am told to “Go back home!” I replied, “I would gladly go back to New York if you buy my ticket.” I get this jaw dropped, dumbfounded look from an ignorant person who thought I did not understand what was being said, smiled, turned around, and walked away. As soon as I turned around to see who was saying these words to me, I was simultaneously looking for a way out of the store if I needed it and for security. It has become a rampant issue, especially since people in FL are not as accustomed to seeing Muslim women integrating into an American lifestyle. When I was younger, living in New York, I learned that there was no difference between us and any other person walking the streets in America. Just because we spoke another language didn’t mean we didn’t belong; every block we walked down had people speaking Spanish, Chinese, Russian, etc. Just because we were Muslim and went to the mosque for prayer didn’t mean we were any different than the Catholic who went to church or the Jew who went to the synagogue. My parents came to this country to give my siblings and I a better life full of opportunity just like many other parents from all walks of life did for their children. We took advantage of these opportunities by studying hard, going to college, and adjusting between two worlds, our family’s values and traditions, and our country’s (America) values and traditions. This is a country where we are supposed to be free to follow our chosen faith, speak our minds, and follow our dreams. These days it seems that these American values no longer apply to all citizens, but rather only those who do not wear hijab or go to a mosque. How am I a free American when I have to live a life fearing for my girls’ future as potentially hijab wearing young Muslim women? That is not freedom; that is also considered a form of terrorism in my book. The definition of insanity…Haven’t we been here (in Iraq) before? As U.S. Defense Secretary Ash Carter tells of new expeditionary group to battle ISIS, based in Iraq, powerful Iraqi Shiite Muslim armed groups on Tuesday rejected and pledged to fight any deployment of U.S. forces to the country. Iraq’s Prime Minister, Iraqi Prime Minister Haider said Iraq didn’t need foreign ground troops. Kata’ib Hezbollah spokeman: “We will chase and fight any American force deployed in Iraq.” Similar statements have come from the Iranian-backed Badr Organization and Asaib Ahl al-Haq.